“There’s a big chunk of Dave and Sharon Ramsey and the Ramsey Family Foundation that helps support what we do so that we can take young women in free of charge and they can experience tremendous life change,” said Nancy Alcorn, Mercy Multiplied’s Founder and President, during a recent staff devotional session at Ramsey Solutions in Franklin, Tennessee. 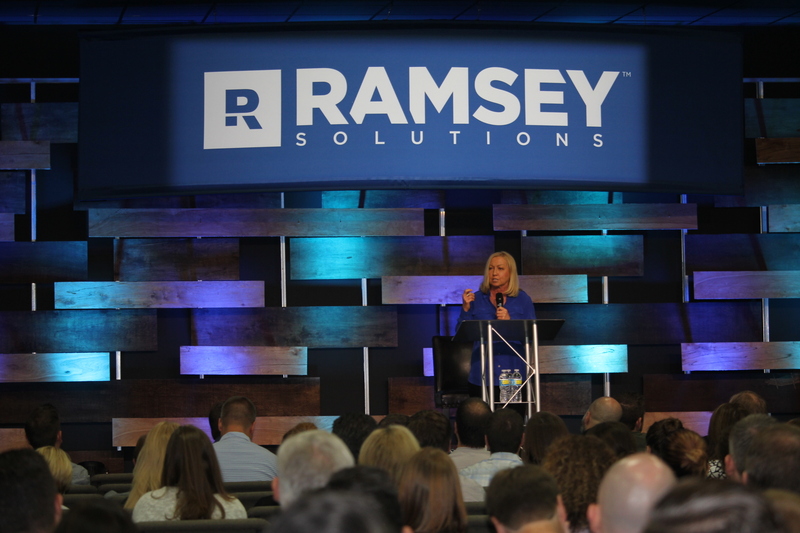 Nancy shared Mercy’s mission and work with nearly 600 staff, including stories of how Ramsey’s Financial Peace University (FPU) has been a transformational force in the lives of thousands of Mercy graduates. Nancy’s friendship with Dave and Sharon Ramsey goes way back. 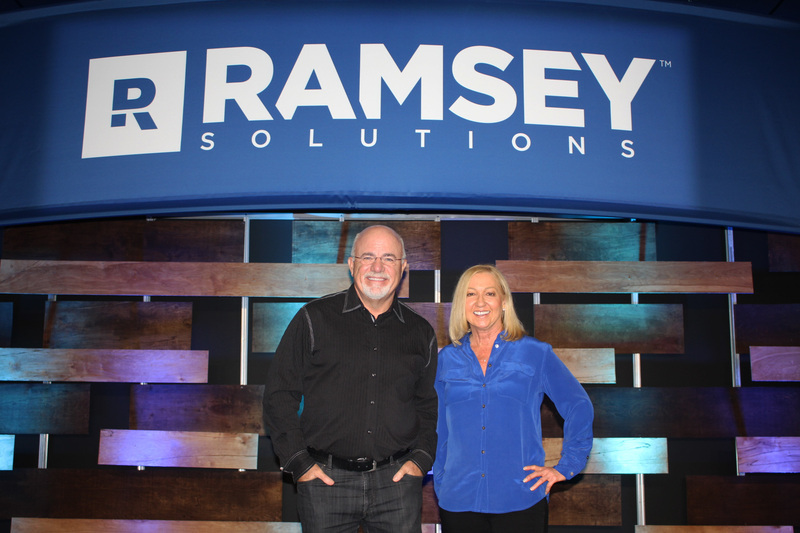 Nancy told the Ramsey Solutions staff, “Dave and Sharon have been so key in my life, and I love them like a brother and sister.” She shared that she knew Dave back when he was selling his first book out of the trunk of his car. “When I first met Dave, he was trying to figure out what he was going to do with his life. I remember him saying, ‘I think I’m just going to write a book and tell the world all the stupid things that I did, so that they won’t do the same stupid things that I did.’ And look at what God has done!” she said. To encourage the Ramsey Solutions staff, Nancy shared several of these stories, including a story about Ali, a 2009 Mercy graduate. Nancy read to the staff a note Ali had written specifically about FPU’s impact in her life: As a result of FPU, I have applied for and received a ton of scholarships to cover my nursing school expenses, and what hasn’t been covered, I’ve paid for myself. I have not had to take out a student loan. Something God really impressed on me is that I need to go through nursing school completely debt-free. I feel like God is blessing my efforts. Currently, I am also saving up money for a newer, much more reliable car. That’s probably going to take longer than I’d like, but I’m plugging along. FPU has changed the way I shop, with needs vs. wants and with going into my future without any debt. Nancy also shared how 2013 Mercy graduate Porsha was physically and sexually abused as a child and came to Mercy severely depressed and suicidal. At Mercy, Porsha learned who she was in Christ and replaced the lies she once believed about herself with God’s truth. She also learned about money management through the FPU teachings. Nancy read a thank you letter from Porsha to Dave and his staff: After Mercy I didn’t have any debt, but I always found myself with no money and no savings. I didn’t know where my money was going, and I thought I could keep track all in my head, but I noticed I was a social spender. With my mentors’ help, Dave Ramsey’s Financial Peace University, and prayer to renew my mind, I started sticking to my budget, writing everything coming and going, building up my savings, and setting financial goals. I now have my own car that paid for in cash – a 1999 Buick LeSabre. It’s in very good condition. I use the envelope system, and I have money to pay all my bills, put in savings, and have fun. Now I’m on my way moving into my new apartment with the savings that I have built up! I have everything that I would ever need and want – I live in no lack!! Also I was able to share my journey with a friend, and they now live in financial peace! They came to me shocked I didn’t have a credit card or any loans, and I simply told them…-If you will live like no one else, later you can live like no one else.- Thank you Mercy and Dave Ramsey for these tools! Visit Mercy Multiplied’s Success Stories page to read more graduates’ stories. Also visit Partner With Us to learn more about how you or your organization can support Mercy’s efforts to help young women find freedom from life-controlling issues.